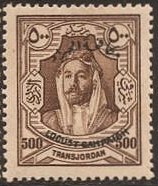 In 1930, Jordan, then a British Mandate Territory, overprinted some of the stamps from its 1927-29 Amir Abdullah ibn Hussein issue to produce a set of twelve semi-postal stamps to raise funds to help combat a plague of locusts (Scott #B1-12). 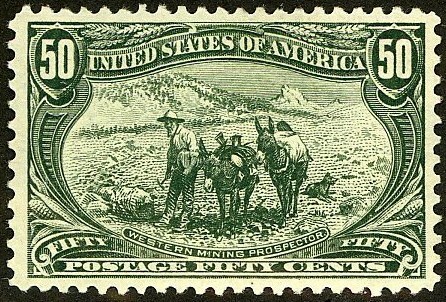 Only 1,802 sets were issued, and Scott '12 prices the unused set at $235.90 . Though in many cases I recommend obtaining expertization of better overprinted stamps, it isn't necessary in this case, because the difference in value between the basic stamps and the overprinted ones is not significant. However, there are four overprint varieties within the set that should be purchased conditional on obtaining expertization - the 2m and 15m inverted overprints (Scott #B1a and B6a), the 5m double overprint (Scott #B4a), and the 500m 'C' of "Locust" omitted variety (Scott #B12a). While quantities issued of these variety is unavailable, it is likely that a few hundred of the first three and fewer than fifty of B12a were issued. The better stamps of the Mandate period have dual market appeal to collectors of British Commonwealth and Jordan. Jordan is a small country of 6.3 million people with limited natural resources. Nevertheless, it is an emerging market nation, largely due to its liberal economic policies and relative political stability compared to many of its neighbors, and it has maintained an annual GDP growth of 5% -6% over the last 5 years. Currently, its main industries are fertilizers, tourism, and banking, but it also has a developing "knowledge economy," which is contributing to its nascent aerospace, defense, pharmaceutical, and ICT sectors.